The fort is a treasure house of history and historical monuments the approach to the fort is very difficult, the one mile steep serpentine thoroughfare is exhaustive and the fort is reached through huge seven pols of gates, which are in fact the strong points having a watch tower and massive iron spiked doors. A standing sentinel to the courage and valor of Chittaurgarh, it stands tall over a 180 meter high hillock covering a massive area of 700 acres. 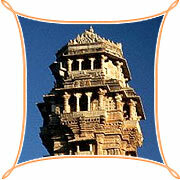 The fort is belileved to have been built by the Maurya rulers in 7th century AD. It was ravaged thrice, and each time phoenix-like it rose again Allaudin Khilji was the first to sack Chittaur in 1303, legend and history corroborate that this was because of his passionate desire to abduct Rani Padmini. Yet she preferred death to dishonor, and committed Jauhar (self immolation) along with the other ladies of the court. Chittaurgarh was plundered again in 1535 by Sultan Bahadur Shah of Gujarat and finally by the Moghul Emperor Akbar, in 1567, in an attempt to subdue Maharana Udai Singh. The fort is approached through massive pols of gates. Near Bhairon Pol, is a cenotaph or 'chhatra' in honor of the chivalrous Jaimal and his cousin Kala, who laid down their lives whilst defending Chittaur against the Mughals. Jaimal who was seriously wounded, but was not ready to die in his bed , thus he was carried into battle on the shoulders of his cousin Kala , both of them died while showing exemplary courage.